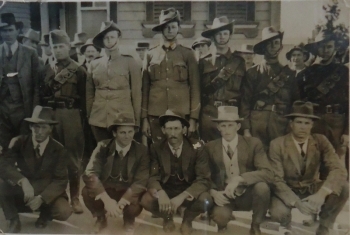 The Light Horsemen in this photograph are believed to be the second group of recruits to leave Inverell together for World War 1 service. 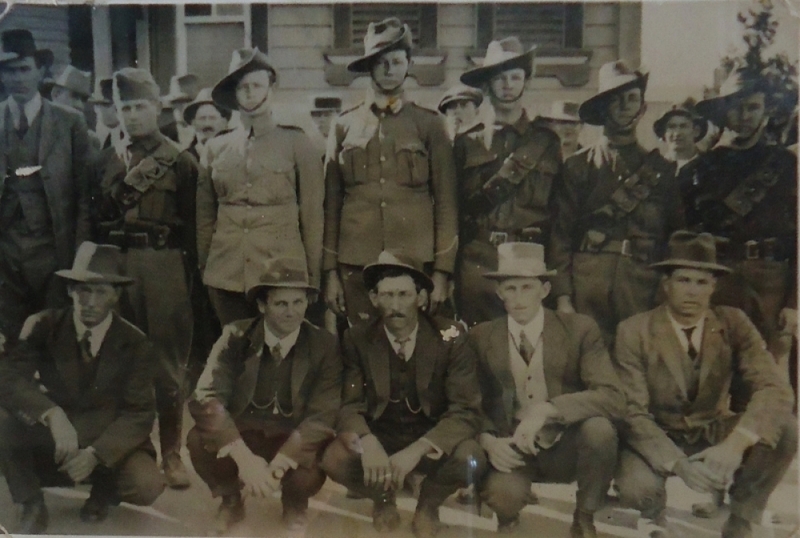 They were farewelled on 21 August 1914. L to R Back: Linde Smith, Snow Campbell, Mat Wisken, Dave Tomlinson, Alex McLean, Bill Caldow, Les White. Front: Edward Vic Tighe, Jimmy Hogg, Owen Fox, Roly Dunlop, Edwin Leese. ... that a large crowd assembled at the Railway Station where the Independent Pipe Band played and Alderman Howard made a speech wishing them ... God speed in their new mission to do their share for the Empire. Sadly recruits Campbell, Fox, Leese, Smith, Tighe, Tomlinson and White did not return home.